Do wolves only eat cattle on public land? As absurd as this question may sound, some have tried to distract people from discussing the actual wolf problem in Eastern Washington and instead want to know if the affected ranchers are grazing on public land. Their goal is to suggest the rancher and his livestock don’t belong there. However, it is time that we share some important facts. First, the wolf attacks that have occurred in the “Wedge” area of Northwestern Washington this summer have occurred on public and private land. Simply put, a wolf cannot read a map. It will follow prey species wherever they may be and will attack based on its desire, not its geographic location at the moment. The kills/injuries on cattle have been on private ground at least 50 percent of the time. So the notion that wolf attacks would not occur if the rancher was not on public land is absolutely false. * The actual cost of utilizing public lands is on par with private market grazing lands. There is no such thing as “welfare ranching” on public lands. The notion that ranchers have access to free grazing on public lands or only pay a subsidized rate is false. Grazing allotments are not free, but rather ranchers pay an annual fee for use of available forage. In addition, producers who hold grazing allotments invest their own money into improvements like fencing, water developments that are used by both cattle and wildlife, cattle guards and other infrastructure. Additionally, the use of public lands often involves higher operating costs in staff, fuel and the additional loss of cattle to poachers or predators as compared to private grazing lands. Some of the frustration with grazing on public land often comes from a poor understanding of it, or perhaps from the poor stewardship example of some ranchers. However, just as there can be a few ranchers who may not be good stewards of their grazing allotments, there are also careless recreators, campers who leave their trash behind and people who deliberately dump junk in the national forest. All of these behaviors have negative impacts to public land and can invoke penalties. Public land should be managed in a way that properly manages the resource to public benefit. Grazing economically utilizes a natural resource in order to benefit national and international food supplies. A survey of open space in the U.S. showed that approximately 85 percent of U.S. grazing lands are unsuitable for producing crops. Grazing cattle on this land more than doubles the area that can be used to raise food. *Cattle reduce the fuel loads for wildfires by grazing and help to keep space open for both recreators and wildlife. Left unchecked, brush, weeds and grasses can quickly choke open ground in forested areas, creating a dense, dry thicket that creates hot fuel for wildfires. An absence of open areas and trails can also make areas difficult to navigate for both wildlife and recreators. By travelling across public land and eating these plants, cattle put to use a potential hazard and help to improve the landscape. In this case, the city or neighborhood has paid for this service. In the case of public lands, the cattleman is both paying for and providing the service. *Cattle help to promote ecological diversity and wildlife habitat. lands, biodiversity of species depends greatly on ranch land. wildlife, ecology, zoology and veterinary science, ranching on both public and private land “has been found to support biodiversity that is of conservation concern” because it “encompasses large amounts of land with low human densities, and because it alters native vegetation in modest ways.” Dr. Knight also noted that other uses—such as outdoor recreation and residential use—are not as conducive to the support of threatened or endangered species. Wild birds and mammals seek out and thrive in the shelter provided by natural ranch features, like diverse plant cover and windbreaks, as opposed to row-to-row crops or bare landscapes. Many ranchers across the West are purposely implementing grazing practices to improve habitat and help prevent adding species, such as the Greater Sage-Grouse, to the Endangered Species List. According to NRCS, ranchers have already employed practices to help save between 800 and 1,000 grouse. Large animals such as elk also are known to thrive in areas where cattle graze. For example, the Montana Department of Fish, Wildlife & Parks reported that rotational cattle grazing on the Wall Creek Wildlife Management Area helped bring the elk population from 250 to 2,500. Similarly, a study in Texas revealed that 80 percent of deer habitat was grazed by cattle. In western South Texas, the largest bucks were 20 pounds heavier on ranches with cattle compared to ranches with no cattle. 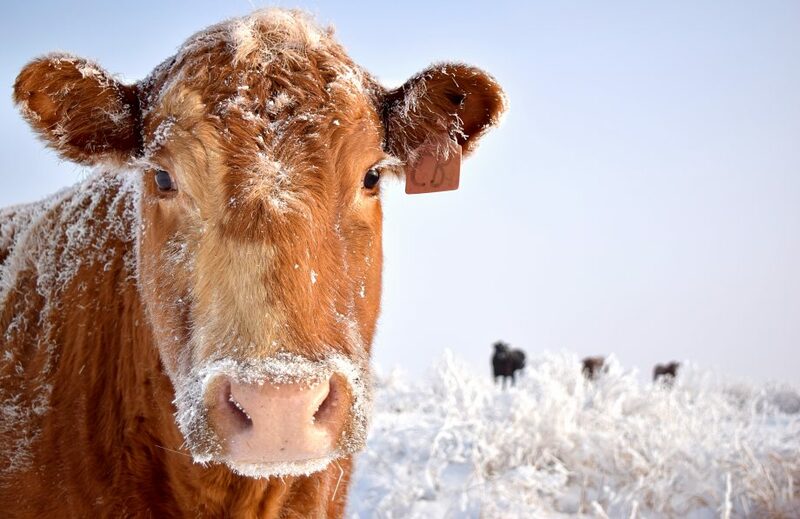 Cattle farmers and ranchers may provide supplemental food, such as hay, to help wildlife populations survive tough weather conditions, such as a cold or overly snowy winter. The improvements farmers and ranchers make to water sources—building, maintaining and protecting reservoirs and stock ponds, for example—can also improve and, in some cases, create wildlife habitats. For example, research has shown that some threatened species, including the California tiger salamander and red-legged frog, appear to be more abundant in vernal pools near cattle grazing than those where cattle are not present. The researchers said lack of grazing should be considered as threatening to these systems as overgrazing. *Grazing keeps a human presence on public lands that may otherwise become havens for illicit activity like poaching, timber thefts and marijuana growth. When cattlemen and other livestock producers use public lands for grazing, they are helping to prevent the abuse of public land by keeping a watchful eye on remote locations. With federal land agencies like the U.S. Forest Service facing declining budgets and increased demands on personnel, ranchers help fill the gap in monitoring public lands. A livestock producer who is out regularly checking on herds and monitoring pasture can help reduce the opportunity for illicit activity. The current statistics suggest this service is needed. During calendar year 2010, nearly 10 million plants were removed from illegal outdoor grow sites in seven states: California, Hawaii, Washington, Oregon, Kentucky, Tennessee, and West Virginia. More than 46 percent of the marijuana plants eradicated in 2010 were eradicated from public and tribal lands. Marijuana grow sites are typically in excess of 1,000 plants per site and sometimes more than 200,000 plants, according to the Office of National Drug Control policy. In August of 2012, Federal agents and U.S. attorneys in seven states carried out an eight-week operation targeting illegal marijuana cultivation on public land, destroying 578,000 plants valued at over $1 billion, according to the Justice Department. Managed grazing can also provide benefits to the areas between land and water sources, while reducing soil erosion. Because proper grazing encourages the growth of healthy riparian areas by reducing the prevalence of invasive species, soil is less likely to run off the land and cause environmental problems after heavy rains. Cattle, like all other living creatures, require water, but cattlemen recognize that everyone plays a role in water conservation. Cattle farmers and ranchers reuse or recycle water by collecting rainfall or using wells in order to use less water and make sure that the environment is sustainable for future generations. Thanks to water conservation on cattle farms and ranches, each pound of beef raised today uses 14 percent less water than 30 years ago, according to a study from Washington State University. 1 J.L. Capper, Comparing the environmental impact of the US beef industry in 1977 to 2007. 2 U .S. Department of Agriculture (USDA ), National Agricultural Statistics Service, 2011. 3 USDA Economic Research Service, Major Uses of Land in the United States, 2002, EIB-14. 4 Drovers News Source, USDA Publishes Grasslands Reserve Final Rule. Nov. 30, 2010. http://webcache.googleusercontent.com/search?q=cache:6byzR4SnrdcJ:www.drovers.com/news_editorial.asp%3FpgID%3D675%26ed_id%3D8204+http://www.drovers.com/news_editorial. the New West? Rangeland Ecology Management 61:127-147, March 2008. 6 R.L. Knight, Ranchers as a Keystone Species in a West that Works.” Rangelands, Oct. 2007. 8 T . Daubert, Wildlifers Learn to Love Cows.” RANGE Magazine, Summer 2002. A&M University-Kingsville. Cattle Management to Enhance Wildlife Habitat in South Texas. Management Bulletin No. 6, 2005. Biological Conservation. June 23, 2006. 13 Texas State Energy Conservation Office. http://www.seco.cpa.state.tx.us/re_biomass-manure. 14 Profile of U.S. Cattlemen, Aspen Media & Market Research, July 2010.
and Management Options. Journal of Animal Science. Sparks, Advances in Agronomy, Vol. 103, Burlington: Academic Press, 2009, pp. 1-40.